Every once in a while, an odd set of people who drive cars with no radiators and the engine in the wrong end get together. When they do, things seem to turn out pretty great. Sadly, I got there pretty late and some of the best cars of the show were leaving as I came in. This “RSR” was in the parking lot, not even in the show! The owner of this beautiful 911 pegged it as he left and it sounded fantastic. With so many overrestored Porsches nowadays it’s awesome to see one with “no-fucks-given” paint. I love the Outlaw style of this one. Leather straps on the front, so you can call it a Porsche Suitcase. 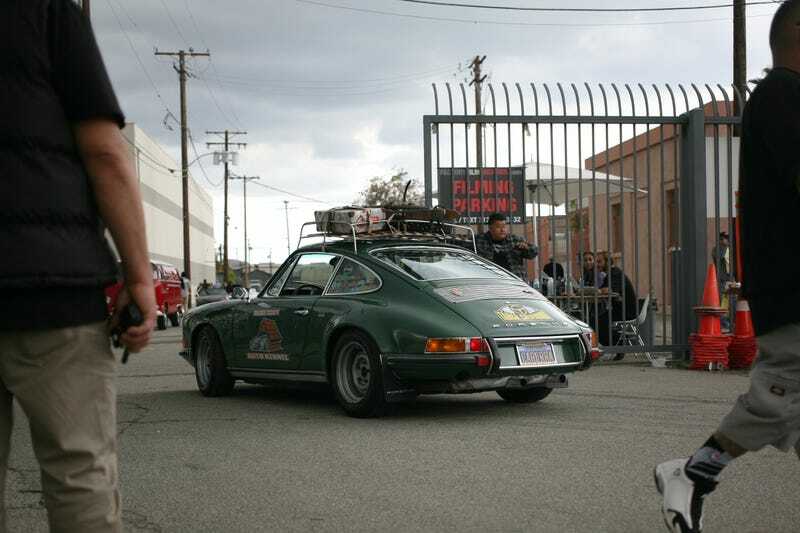 Mr Magnus Walker brought out one of his 930s. Note the Porsche bike on the side! Once again, another 911 with “no fucks given” paint. That’s the best kind of Porsche, one that gets used and abused. Poor 356 had to leave on a tow truck. Speaking of 356s, odd front end on this one. I dig it though! Fikse makes some absolutely killer wheels. After some careful Googling, I’ve come up with the result that this is a Porsche Abarth 356B Carrera GTL (quite a mouthful). Quite a handsome little car, though it looks terrified from the front. Canepa brought out a Stage III 959, along with a 934. Oh my, what’s that in the reflection? The best part about this early 356? Semiphores!!! Just on the front fender, behind the wheel. This GT3 RS 4.0 was so used it was fantastic. Unwashed, but well cared for. Cats and Porsches? Cats and Porsches. The silver haired gentleman on the right owned this RWB 911. Exactly who I would imagine based off of it’s style. Better than just a 914-6? A 914-6 TRUCKLET. I can’t imagine what this may be...possibly a 993 RS? I feel bad for the owner of this Porsche tractor. Everyone kept putting their damn kids on it and it was impeccably restored. RS Americas were few and far between at this event, not shockingly. A different sort of speedster...a less street-able one. Another Outlaw, but a rather tame one. I like this look, but my issue with it is that it seems like they tried so hard to get the “not trying” look. Just look at how the primer on the A pillar transitions to paint. This female-owned 993 Speedster was impeccably cared for. She even took off her walking shoes to put on a clean pair before driving it, also putting down all-weather floor mats as to not get the carpet dirty. A 993 Turbo in a color other than silver, quite the rare find! Green really suits it well. Now THIS is real patina. As you can tell from the stickers, this car has seen some stuff over the years. I absolutely love the classic Brumos Porsche plate surround. I mean, it’s basically a Porsche anyways. The auction/charity car for the day. It went for $275,000, if I remember correctly, with the money going to pancreatic cancer research. The Canepa 934. Totally flawless. I hope to one day have this plate frame be accurate for myself. Bye bye 934! It was quite a tight fit. They loaded up the 959 after the 934. Yes, the door is touching the side of the trailer. Believe it or not, but this isn’t black. It’s actually an incredibly dark brown. Race-style, but targa? Zipper window too! Quite the livery on this 356. Hmmm, I wonder if this is a 356B. Maybe a 356C? Goodbye my fine gridded friend. Something other than the fact that they both had under 18,000 miles. It’s the fact that they were both Japanese spec models. Back to the shocked Abarth. As the raced out 356 was being loaded up, I couldn’t resist grabbing a couple more shots of this gorgeous 993 Turbo. The dirty RS 4.0 again. They were loading microphone cables into the front! Right outside the show was a superboat. And then I said goodbye! Off to further adventures without radiators.